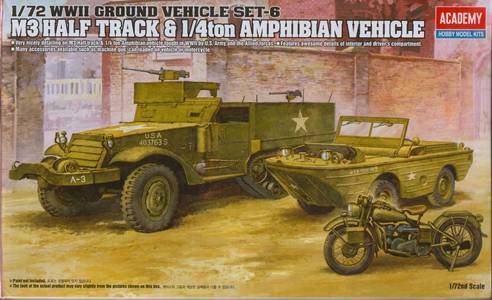 This Ford GPA comes as part of Academy's "WW II Ground Vehicle Set #6", where it shares the box with an M3A1 Half Track and a Harley Davidson motorcycle. There is a tubular structure on the nose (which I guess is the exhaust) that is not present on all vehicles. The rectangular panel underneath seems to be hinged, as can be seen here. The ribbed arched structure on the nose could be pivoted forward. I guess it served to improve flotation. It seems the prototype did not have the typical ribbed structure on the hull. When the windshield was raised, it often was complemented by canvas segments on the sides. The raised structures on the left and right of the rear deck should have some night driving lights. These were not present on all vehicles, though. While there are lights on the rear hull sides, the ones on the rear are missing, even though - again - these were not seen on all vehicles. The kit counts few parts, so this is your quickbuild kit par excellence. There are ejector marks on the insides of the wheels, where they are easy to fill in, and on the back of the seatrest where they are a bit harder to correct. I ended up removing all detail from the back of the seats and making springs from copper wire. They are not perfect, but are hard to see with the seats slightly reclined and the stowage I've added. While at first, I thought the ejector marks in the crew compartment on the top of the wheelbays (beneath the rear bench) would be invisible after construction, they still partially remain visible. (That's why they invented dryfitting, I guess.) Again, with the stowage I was going to add, that's no big deal. I was too lazy to try and add glass panes to the windshield, as these are not included in the kit. (Weekend project, remember ?) Furthermore, there are some hard-to-correct ejector marks on one side of the windshield. I went for a tarp cover instead, made from sanitary paper. Unfortunately, the carpet monster was in a rather voracious mood (or just needed the sanitary paper) and swallowed this rather big part. A new tarp covered windshield was made without too much hassle. When lowered, the windshield can't lie flat, as it interferes with the arched structure on the nose (left unpainted in the picture above). Checking with other modelers' endeavors, this seems to be an issue with the design of the kit, rather than with my skills. Perhaps pivoting the arched structure forward might be an idea to make this less conspicious. The GPA has a spartan interior, as can be seen here. Nevertheless, the Academy kit has even less interior, so I decided to at least add the gear stick(s). More adventurous modelers might want to thin the top walls of the crew compartment, as they are rather overscale. Wanting to depict the vehicle seen here, I added a dent to the left side of the nose. This was done by thinning the inside of the hull and then pushing a blunt tool into the nose. A command pennant (recovered from an Eduard detail set for the Schwimmwagen) was added. Apart from the above, there is very little to mention about this kit. The vehicle was sprayed in a uniform green enamel color. Two coats of AK chipping fluid and a coat of acrylic white followed. Moistening the paintcoat ten minutes later and some persuasion with a stiff brush gave the result seen in the pictures. The rest is traditional weathering. Note that I chose to paint the seats in a leathery color, solely for artistic purposes. The same argument goes for the whitewash, for that matter, as the only picture of the vehicle doesn't show any. Markings are completely absent in the picture, so none were applied.